Xiaomi has launched Xiaomi Black Shark Gaming Phone in China. It features a 5.99-inch FHD+ display powered by Snapdragon 845 with up to 8GB RAM. It comes with liquid cooling to keep the phone cool when gaming by reducing the CPU’s core temperature by up to 8-degree. It has a dedicated One-touch SHARK key that provides immersive gaming experience. You can use the fingerprint sensor on the front to quickly access several features such as silent mode, DND and more when gaming. There is a glowing logo on the back of the phone. It has a dedicated image processing chip from Pixelworks offering intelligent motion compensation technology, image enhancement, dark scene detail processing, for smooth video quality when gaming. It has ‘X-style’ unique antenna design so that there are no signal issues when hold the phone both vertically or horizontally. On Camera it has a 12MP rear camera with f/1.75 aperture, 1.25µm pixel size, dual-tone LED flash, secondary 20MP rear camera with 1.0µm pixel size, f/1.75 aperture and 20MP front-facing camera with 1.0µm pixel size, f/2.2 aperture The Gamepad can easily attach to the side of the phone and weighs just 40 grams so it is easy to carry. It has model number H66, uses Bluetooth 4.0, works on devices running Android 4.4 or later and packs a 150mAh battery offering up to 30 hours of usage on a single charge. 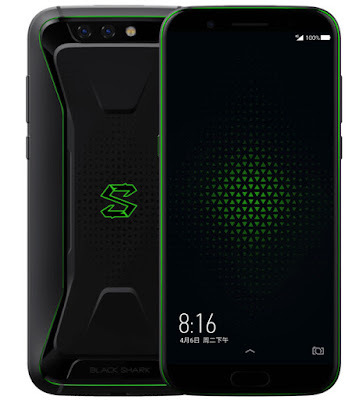 Black Shark is priced at 2999 yuan for the 6GB RAM with 64GB storage version and the 8GB RAM with 128GB storage version costs 3499 yuan. The Gamepad costs 179 yuan.